A fast, tense race burst into a chaotic finish to close out the women’s KISS Super League on Tuesday. Racers rode three laps of the Watopia Flat course in reverse for a total distance of just over 30 kilometers. These roads were used in the first round of the women’s KISS Super League, but in the opposite direction. This time, each lap begins with a series of short, rolling hills before leading into flat terrain. This is a fast race course that favors a bunch sprint, but there are a few small “kicker” hills where attackers have a chance to shine. The final stage of the KISS Super League was fast, and the tension built with each lap. There were very few attacks. The racers were focusing on making it to the finish line with the group for one last shot at glory. For the first 20 kilometers, most of the action came from the intermediate sprints. 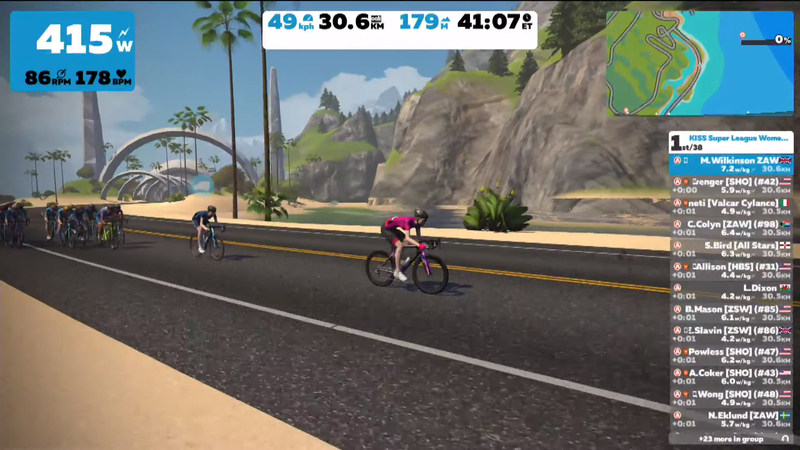 Leah Thorvilson (Zwift Academy Dream Team) and Starla Teddergreen (Hagens Berman – Supermint) battled it out for sprint points. Teddergreen took the first intermediate sprint, and Thorvilson nabbed the second. It came down to the third and final lap, where Teddergreen led out the sprint and crossed the banner first. Teddergreen’s hard effort caused her to drop from the group right afterward. But she had won the sprint competition. The first attack came with about 8 kilometers to go. 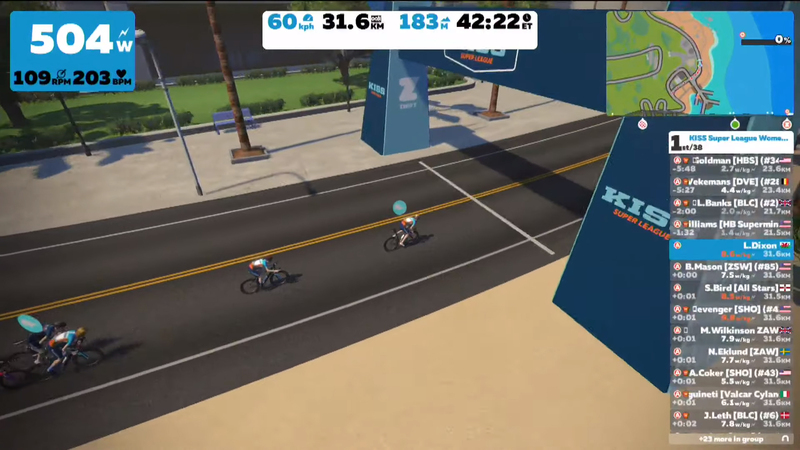 Leah Dixon (Zwift All Stars) broke away, and Amanda Coker (Sho-Air Twenty20) started to go with her. But the peloton was motivated for a sprint and quickly chased them down. 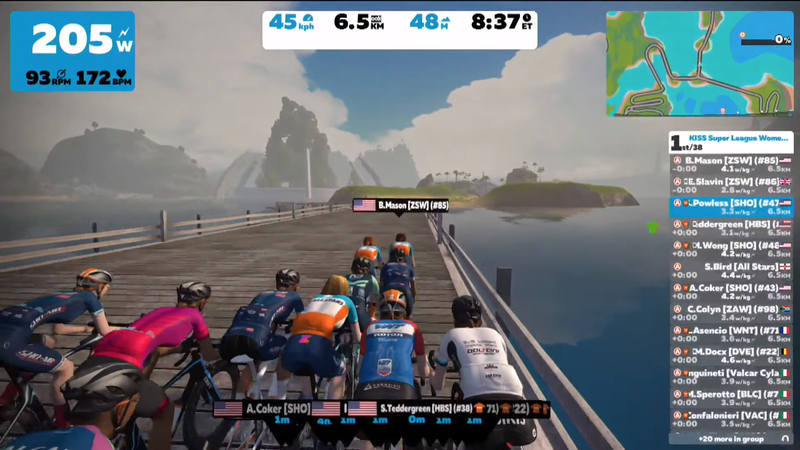 On the short kicker out of the Ocean Boulevard tunnel, two Zwift Academy Dream Team riders shot toward the front. Catherine Colyn used a lightweight feather PowerUp to get there, followed by Mary Wilkinson. Then Wilkinson kept going. She was trying a late attack! It wasn’t a sprint but a long surge in power that began to rip the group apart. She got a gap of a couple of seconds and used her aero PowerUp to go even faster. Erica Clevenger (Sho-Air Twenty20) reacted quickly with a draft truck PowerUp – a good choice to help her hang on to Wilkinson’s boosted speed. Ilaria Sanguineti (Valcar-Cylance) and Coker joined them after a strong effort. This small group still had a lead on the others with less than 500 meters to go. 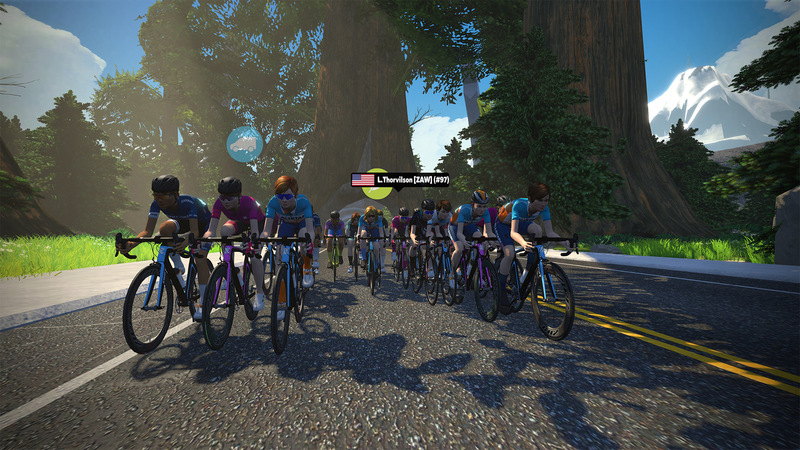 The bunch had split apart, and Britt Mason (Zwift All Stars) led a chase of several riders behind. She launched her own aero helmet PowerUp to start her sprint. Mason and two of her teammates caught and passed Wilkinson’s group speeding for the finish line. Leah Dixon took the win for the Zwift All Stars, who clinched their overall victory with a 1-2-3 podium sweep! Throughout the league, participating teams earned points based on their riders’ positions in the race. Each team’s best-scoring 6 out of 8 races were tallied up in the final ranking. 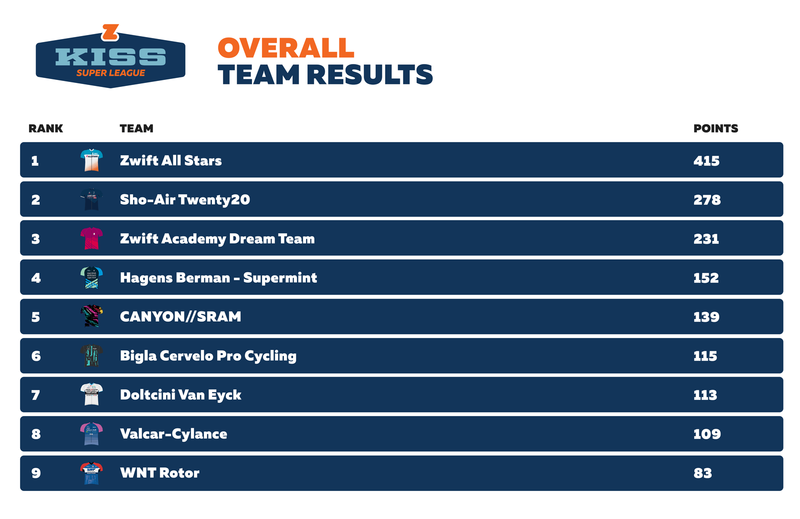 The Zwift All Stars team grabbed the lead early and held onto it, with consistently strong performances each week. Among the professional teams, Sho-Air Twenty20 put up the toughest fight to challenge them, finishing in second overall. The Zwift Academy Dream Team took third place. 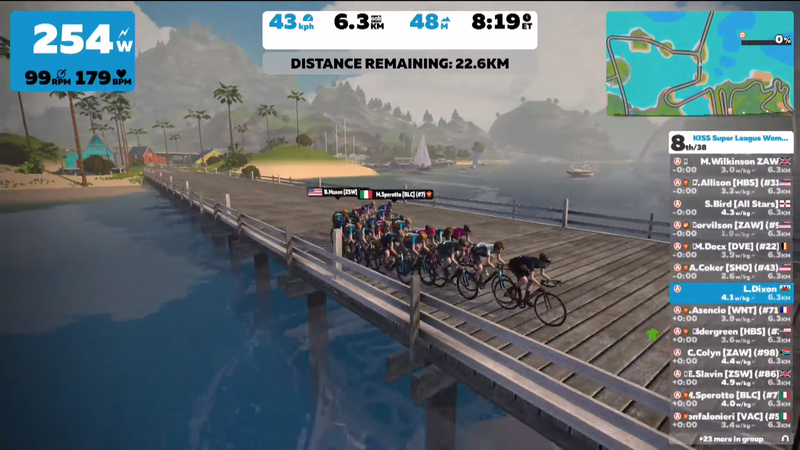 For most Sho-Air Twenty20 riders, this was their first time racing on Zwift, so they did a lot of studying to learn how it all worked. Clevenger said she was frustrated during the first round when she attacked and then “flew out the back” when the peloton caught her. She did some research and learned that when you stop pedaling, Zwift applies a braking effect that slows down your avatar. Clevenger said she “absolutely loved” racing the KISS Super League, including the learning process. Dixon wasn’t expecting to win on a course like this. When Wilkinson attacked later, Dixon said, she didn’t think she could follow it. Several racers from different teams gathered to compete live at the KOERS Cycle Museum in the Flanders region of Belgium. Among them was Ilaria Sanguineti (Valcar-Cylance). She and several other KISS Super League competitors raced on the famous cobblestones and hills of Flanders over the weekend. Coker said she’s very proud of how well Sho-Air Twenty20 has raced as a team, working together to place all of their racers as high as possible. Her own goal was usually to stay at the front. She tried to make sure the team didn’t miss moves and kept pushing for a stage win. This week, everyone seemed to have the same strategy – stay alert, and save energy and a PowerUp for the final sprint. Miss something? Want to experience the women’s and men’s KISS Super League all over again? 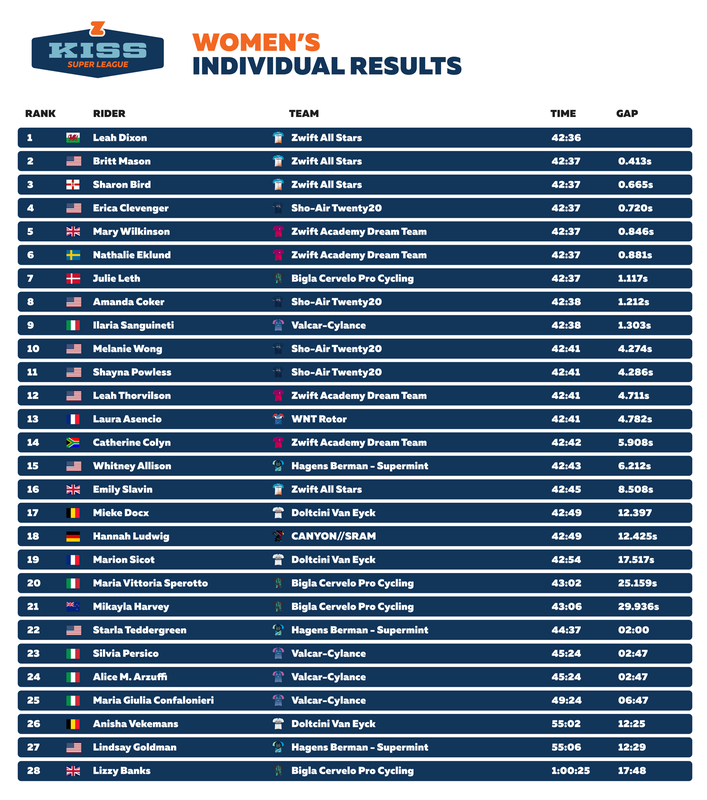 Catch up on race highlights and results at Zwift.com/KISSRacing.